Never one to let a good franchise die with a single entry, it was inevitable that Disney would finally come around and get to revisiting the brand name at some point to turn that single movie into a whole franchise (you know, apart that one time when they totally did make a sequel in the form of the video game Tron 2.0). Even so, while the 28 years it took them to release a cinematic follow-up may not have been the longest gap between the original and its sequel for the studio (that honor goes to Bambi II, which has the honor of having the longest gap between any movie and its sequel at over 63 years and was also one of those oddball sequels like The Jungle Book 2 and Return to Never Land that got a theatrical release in some markets), it was certainly becoming more and more unexpected as time went on, given the particularly cult status the original film had. Sure, a video game follow-up seemed pretty logical given the nature of the story and the fact that it was less of a gamble in that medium, but to release a big budget sequel to a film the studio would later have to clarify to people the nature of its existence in subsequent home video releases (“The Original Classic” they called it) definitely caught a lot of people off guard when the studio revealed test footage of Jeff Bridges once again playing the role of Kevin Flynn at the 2008 San Diego Comic-Con. And everybody flipped from excitement, including my roommate at the time. Heck, even I was interested! And I didn’t even really like the original all that much! It would be another couple years until the film’s actual release, however, but was the wait worth it? Well, that depends on what you were expecting, honestly. Those of us who were pining for a new film franchise akin to what The Matrix franchise was supposed to be were likely left disappointed by the fact that the Tron relaunch, which also included its own animated spinoff in the form of the spiffy but intermittently dull Tron: Uprising, was a lot less like those expectations and more like what The Matrix franchise ultimately turned out to be. Those of us who were keeping expectations a little more in check may have been a bit more satisfied with what resulted from Disney’s revival, even if the flaws were pretty readily apparent. The film is pretty much as close as one can get to making a sequel that is also practically remaking the first film. A member of the Flynn family breaks into the Encom headquarters with the intention of sabotaging the plans of one of the company’s top brass members in an effort to right the wrongs they committed once they reached the top and got greedy. Alan Bradley is involved in both films and has an uneasy relationship with the Flynn featured. That Flynn is inevitably digitized by a laser and pulled into a world where computer programs are given human-like form and have their own society. Said society, however, is ruled by a power mad dictator who subjects dissenters and the unwanted to a series of death games, from which the digitized Flynn makes his escape only to partner up with an enigmatic freedom fighter and their sidekick. Then it’s just a race to defeat the evil dictator before they can affect the world outside while also liberating the digital citizens of the computer world while making it back to the physical world. The end. Yeah, unlike the original, Legacy certainly isn’t going to win any awards for originality, but I’ll give it this: It certainly masks this recycled storytelling with some new tricks and a massive dose of style. The film does a nice job of catching us up pretty quickly on the story and what’s happened since 1982 – Kevin Flynn’s disappearance and the subsequent overtaking of Encom by greedy businessmen with little vision beyond the dollar signs in their eyes, not to mention the self-imposed isolation of his son, Sam, who still believes in his father’s vision for the company and humanity – and then quickly builds up slowly until rollercoaster diving into all the awesome parts set inside “The Grid.” Right away, the first thing you’ll notice about the film are the visuals. 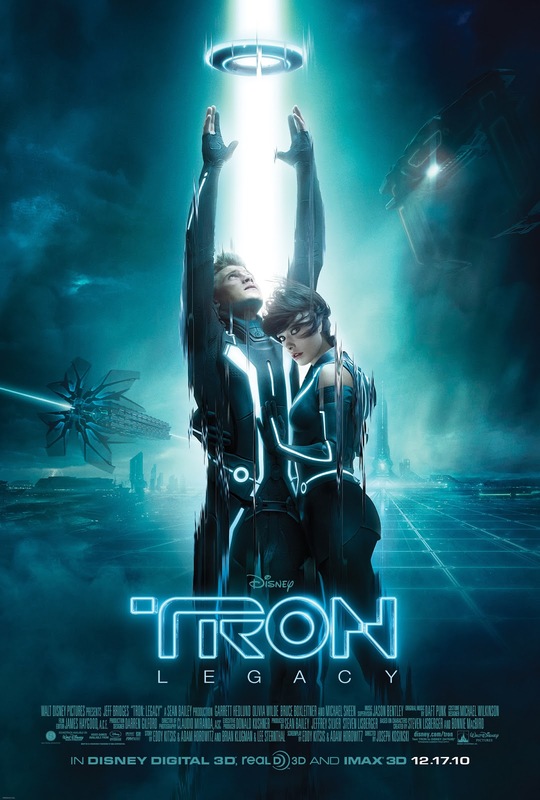 Before Sam Flynn, the new hero of the film, even enters the digital world, Tron: Legacy instantly makes an impression just by how slick it looks – heck, it even features a custom Disney logo castle done up in the new lit up Tron style. Yeah, the digital makeup that de-aged Jeff Bridges to his younger self is… inadequate, but everything else looks stunning. But once Sam does enter the digital world, however, that immediately takes it up to a whole other level, taking the original film’s signature glowing, vector graphics-inspired visuals and updating it with greater detail, cleaner edges, better lighting, and a more modern aesthetic without sacrificing the iconic look and feel. There’s no doubting that this is a Tron movie. Perhaps the other biggest and arguably the best aspect of the movie that you will immediately notice is the outstanding score from Daft Punk. Mixing classical orchestrations with the electronic sound of a rave, the score is exhilarating and dynamic and perfectly accentuates everything happening on screen. Seriously, I’m not an electronic music fan, but even I felt that it should have definitely been considered at the Oscars. The soundtrack is still in my regular rotation of music. Normally, I have to be in the mood for that kind of thing. As for performances? Yeah, they’re pretty good. Nothing extraordinary. Almost all of them are quite likeable, and nobody stands out as being especially bad or anything. Garrett Hedlund and Jeff Bridges definitely seem like father and son. Sam is kind of a generic cocky hero, but the relationship with his father is a refreshing surprise, having very little angst over his father’s absence – there’s definitely an effect on him, but it’s not the devastating cliché crap that we’re often fed in these kinds of movies. Bridges’ return to the role of Kevin Flynn is pretty heavily influenced by his role as “The Dude” in The Big Lebowski (there’s even a reference). His relative seclusion and fight against the film’s villain, CLU, has turned him into a sort of freedom fighter/guru, and, you know, sure… Why not? Bridges continues to be an affable presence, and it’s easy to see the cocky guy from the first film wisening up to this guy. Olivia Wilde joins the cast, too, as the film’s token girl. Unlike Cindy Morgan’s role as Dr. Baines and her digital counterpart Yori in the last film, Wilde does get to play action hero as Quorra, the highly skilled protégé of Kevin Flynn who helps him as a sort of enforcer. Quorra is a pretty fun character, with Wilde playing her as amicably childlike in her devotion and enthusiasm for her work and curiosity about the world beyond, but she still maintains her autonomy and intelligence, all the same. Quorra might very well be the film’s most engaging character. Unfortunately, the same cannot be said for CLU, who is also portrayed by Bridges… sorta. He’s under all that aforementioned heavy layer of digital makeup to make him resemble his 1980s self. CLU, frankly, is just not sufficiently threatening enough to carry the film, his lackeys are far more engaging, and the effects used just make him unpleasant to look at. It’s a rude welcome to the Uncanny Valley, that’s for certain. At least Michael Sheen pops in for a bit to add some campy flavor to the proceedings. If only Bridges showed the same kind of enthusiasm for CLU as Sheen does in his role or even as Bridges himself brings to Kevin Flynn. 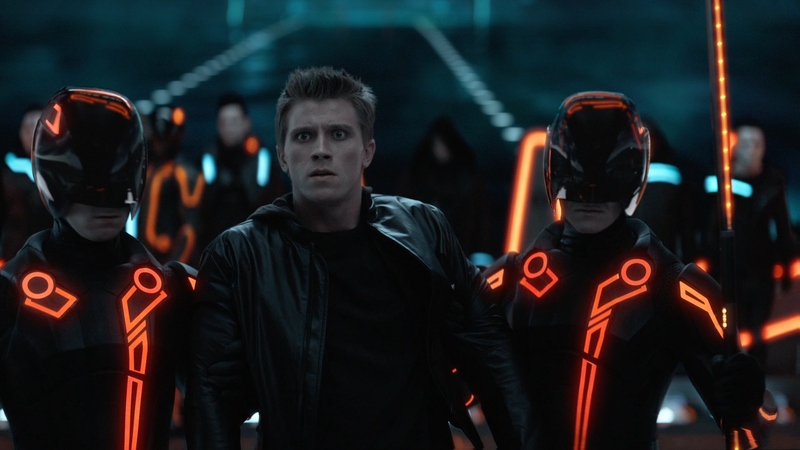 Tron: Legacy borrows quite a bit from its predecessor, but in the process, it also takes advantage of that hindsight and the technology of the time to amp up the action and spectacle while also improving in the areas of pacing and characterization. While both films suffer from the stereotypical big budget film problem of being more style than substance, in both cases, the style really does make up for it. But while both are entertaining enough as they are, even apart from the technological advancements, Legacy just has the edge over the first. It’s not a masterpiece by any means, but if all you’re looking for is an unpretentious action flick with stunning visuals and a killer soundtrack, Tron: Legacy is definitely a film you’ll want to have on hand for when the mood strikes.